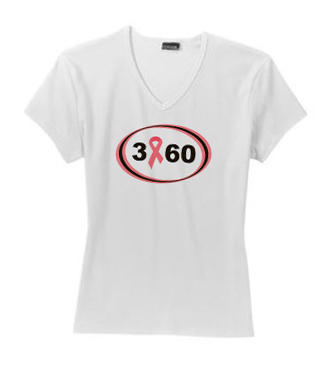 Support Breast Cancer Research and the Breast Cancer 3-Day Walks with our Fitted 3-60 T-shirts. The Breast Cancer 3-Day Fitted T-shirt is 100% cotton and comes in small, medium, large and extra large. We can customize the 3-Day fitted t-shirts for your organization, walk or group. Ten percent of the net proceeds from our Breast Cancer Awareness merchandise is donated to Breast Cancer Awareness organizations. Our fitted 3-60 T-shirt is so soft you'll want to live in it. It's designed for enduring comfort. Pure premium 100% cotton feels great against your skin. Ribbed, narrower crewneck adds a touch of class.